This 10 Days Uganda gorilla safari Bwindi & wildlife safari tour will begin and end in Kampala. This trip in Uganda is the most exciting Uganda safari a tourist can ever choose to take. It is tailored to suit memories and adventurous activities that are very rewarding and exciting. On this 9 days Safari in Uganda, you will visit the Lake Mburo National Park and Queen Elizabeth National Park for your Uganda wildlife safari Uganda, tour Bwindi Impenetrable National Park for a Uganda gorilla safari tour in the forest. As part of your adventure, you will take a boat cruise on Lake Mburo, Lake Bunyonyi, and Kazinga channel found in Queen Elizabeth National Park. You will travel in a 4×4 safari Van, 4×4 safari minivan, 4×4 safari land cruiser or 4×4 coaster depending on the number of people coming for this safari. Your accommodation during these days will depend on your choice ranging from luxury, mid-range and budget. 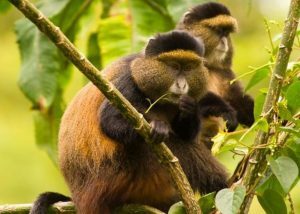 Day 3 of the 9 Days Uganda gorilla safari Bwindi, Mgahinga golden monkey trekking safari tour & wildlife safari: Do a game drives in Lake Mburo National Park. Day 4 of the 9 Days Uganda gorilla safari Bwindi, Mgahinga golden monkey trekking safari tour & wildlife safari: Do an early morning game drive as you depart the park for Mgahinga National park. Day 6 of the 9 Days Uganda gorilla safari Bwindi, Mgahinga golden monkey trekking safari tour & wildlife safari: Transfer from Mgahinga National Park to Bwindi Impenetrable national park. Day 8 of the 9 Days Uganda gorilla safari Bwindi, Mgahinga golden monkey trekking safari tour & wildlife safari: Transfer to Queen Elizabeth National Park. Day 10 of the 9 Days Uganda gorilla safari Bwindi, Mgahinga golden monkey trekking safari tour & wildlife safari: Transfer back to Kampala. Early in the morning after your breakfast at your hotel, prepare to meet your Uganda safari guide as early as 6am. Upon meeting, he will give you a short briefing about 9 Days Uganda gorilla safari Bwindi, Mgahinga golden monkey trekking safari tour & wildlife safari and after you will set off for your safari in Uganda using the Kampala-Masaka-Mbarara highway, a journey that will take about 5 hours covering a distance of about 234km. Along the way, you will break your journey with a stopover at the equator in Kayabwe, a line that separates the southern hemisphere form the Northern Hemisphere. While there, you will have a polar water experiment, take photos in different hemispheres as well as visit the souvenir shops around the equator. After the Equator, you will have a lunch en route in Mbarara at Igongo Hotel and after proceed to Lake Mburo National Park to catch your afternoon boat cruise. During your boat cruise on the lake expect to see Hippos, Crocodiles, Elands, Statungas and Monitor lizards and some other wildlife quenching their thirst along the lake banks. You should also expect see a variety of bird life including the rare African Fin foot. After the activity, you will be driven to your lodge that was prior booked for you. 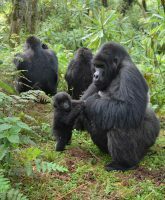 Day 4 of the 10 Days Uganda gorilla safari Bwindi & wildlife safari tour: Do an early morning game drive as you depart the park for Mgahinga National park. Day 6 of the 10 Days Uganda gorilla safari Bwindi & wildlife safari tour: Transfer from Mgahinga National Park to Bwindi Impenetrable national park. Day 8 of the 10 Days Uganda gorilla safari Bwindi & wildlife safari tour: Transfer to Queen Elizabeth National Park. After breakfast, have your lunch packed and after transfer to Queen Elizabeth National Park passing via the Ishasha plains famous for tree the climbing lions. Proceed do a simple game drive there and after proceed to your lodging facility, freshen up, relax and dine. Day 10 of the 10 Days Uganda gorilla safari Bwindi & wildlife safari tour: Transfer back to Kampala.